I wonder if there will be a 'peak telephone numbers' some day (and whether it will be before 2038 when the NANPA space runs out according to the article). The use of pagers has dropped to such a low level several paging frequencies are now disabled and planned frequencies haven't been activated. The same could happen to the telephone network some day. 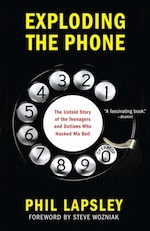 The definitive history of the phone phreaks, available in hardback, paperback, and ebook forms from Amazon | Barnes & Noble | IndieBound | Books-A-Million or wherever fine books are sold.